After a particularly harsh winter throughout much of the United States, it seems like the sultry days of summer simply can't arrive fast enough for hundreds of thousands of the drum corps faithful from coast to coast. As passionate supporters of Marching Music's Major League begin to enthusiastically welcome the first signs of spring and start to count down the days until the sights and sounds of drum corps again fill the warm summer air, Drum Corps International is pleased to provide two exceptional opportunities to experience the thrills of the world's most elite and exclusive marching music ensembles like never before. 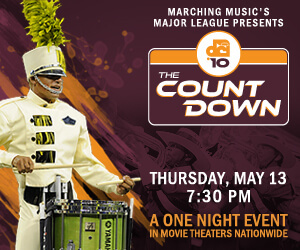 DCI 2010: The Countdown • Thursday, May 13 • 7:30 p.m.
Tickets for The Countdown will be $12.50 and will go on sale through NCM.com/fathom beginning Friday, April 16. Stay posted to DCI.org in the coming weeks for a complete list of participating theaters and additional details. like you've never seen or heard them before! Drum corps audiophiles and videophiles, your dream has come true: Drum Corps International is extremely pleased to announce the release of its first-ever high definition production of World Championship performances on Blu-ray Disc! Shipping begins April 15. "Digital from start to finish," the stunning collection of the 12 finalist performances from the 2009 Drum Corps International World Championships recorded live at Lucas Oil Stadium in Indianapolis, Ind., was designed to satisfy even the most serious home theater enthusiast. According to producer Tom Blair, "I'm incredibly pleased with the way this has turned out. I haven't been this excited about a product in a while. It looks and sounds like a million bucks. It's striking the first time you see it, even to someone who has had HD for a few years at home, and even with high expectations. It is very impressive." Blair's enthusiasm for the quality of the production is exceeded only by the quality of the audio and video included in this two-disc set. "From the very beginning of this project, it has been our intention to place a high priority on the highest possible quality image and audio we can offer. We're using some very aggressive encoding technology and we've spent a couple of months coming up with the best video encoding we can afford. "This project has given us the opportunity to use DTS HD Master Audio, which is something that the discerning audiophiles in our audience have requested since it has existed. DTS is uncompressed, full-bandwidth audio. It's literally the closest possible thing to being there on that night … four times the standard audio bandwidth without any compression to make it fit into a 'smaller box' to deliver to the consumer." "For the initial offering, we kept the focus on maximizing the quality of the content, rather than on additional features," said Blair. "With the high expense of capturing the digital content, along with the tremendous expense related to authoring and presenting the material at the highest possible level of quality, we opted to keep costs down by limiting additional features. We're only producing 1,000 of the two-disc sets for this release, which is a very small run for something like this." The retail price of this landmark edition will be $119. To take advantage of either of these special offers, orders must be placed or postmarked prior to June 1, 2010. Whether celebrating The Countdown with several hundred fellow seasoned corps nuts at your local movie theater, or counting down the days until the start of the 2010 DCI Tour with just a few friends in your living room, we're confident that you'll enjoy the state of the art performances captured with state of the art technology to bring you drum corps excitement like you've never seen or heard it before. *Previous '09 World Championship DVD purchase discount and Countdown ticket stub promotion cannot be combined. Only one $20 discount available per Blu-ray purchase.